I have used Travel FX twice now and delighted with their service. I especially like the e-mails sent when monies in their account and then to say ready to dispatch and estimated day and time for delivery. They arrived early, a great service and thank you. A great experience & service. 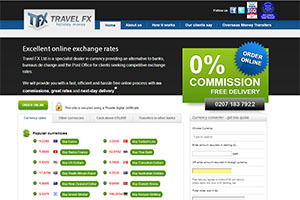 I would recommend Travel FX to all who require foreign currency. I ordered my currency on Saturday 13th April & it was delivered at 9.00am this morning, Tuesday 16th April. I received three emails from them for every step of the process. Excellent service. The whole process took less than 48 hours! I ordered Monday afternoon and had my currency Wednesday lunchtime. I was kept informed every step of the way. Ordered euros online with no bother, ordered was confirmed immediately, arrived as planned at arranged time, so all in all excellent service. Lots of updates during transaction. Buy with confidence. It takes two business days to get your currency, not one as the site implies. I ordered and paid at 3.30pm on 3 April specifying that I needed the money by 5th April. The money reached their account on 4 April (according to them). They sent the money on 5 April so that it would arrive on 6th April. I had to pay an extra GBP30 to get a delivery before 9am on the 6th. When I complained, they told me the two business day period was stated in their terms and conditions. I always use travel fx for my currency. Best rates and kept me up to date on the process from start to delivery. This company gives excellent service. I made a mistake with my order and contacted them where they immediately rectified my mistake and euros were still delivered on due date. Highly recommended. Used TravelFX 3 times now. Simple to order , best rates , quick delivery , what's not to like. This service is second to none seriously I’ve ordered 4 times from here before. Ordered my money yesterday and just received it spot on Travel fx will recommend to anyone. Thank you. First time using Travel FX. Excellent service and money arrived quickly. Will definitely use again for all foreign currency transactions. I’ve used Travel FX for several years now & have to say I have never had a problem with any aspect of the service they provide. Excellent communication & always deliver on time. I recommend them regularly. Ordered £1500 worth of dollars, no confirmation email so phoned and they sent me one, said would get emai when dispatched but didn’t. Did get them on day requested but was a bit concerned with lack of communication given it was a bank transfer, may loose the £5 or so it would have cost to get from a company that allows card payments for added security next time. Excellent! I was apprehensive before entering into the deal but the communication (via email) was regular. Including confirmation of receipt of bank payment, details of delivery, etc. I don't usually write reviews or recommend but felt the service was great! I've only given 1 star because it's not possible to give zero. First of all with a bank transfer there is no protection like there is with a card or PayPal payment. Next, you will never get it the next day, it's always 2 or more days and even longer if you fall foul of their money laudering department. If you're transferring from a bank account then the bank will have already carried out their money laundering procedures. By sending them your bank statements you're also giving them enough personal information for an unscrupulous employee to carry out I'd fraud. In my case they asked for documentary proof of what I was going to spend it on which is impossible for holiday spending money as you don't get invoices until after you've spent it. I didn't get my money on time and had to reschedule my flight at considerable expense and report them to various authorities. They told me it would cost over £600 to cancel the transaction and get my money back. Depending on your destination it's often better to take new £50 notes which dont take up much space and change them as needed. Provided you avoid banks and airport counters you will generally get better rates than in the uk. FIRST TIME I USED THEM, GREAT EFFICIENT SERVICE. I ORDERED £700 OF THAI BAHT, GOOD RATES TOO. I WILL DEFINETLY USE THEM AGAIN. Good service, good rate, use them 2-3 times a year. But why leave it to the last few days ? Order a week ahead.! If the post office foul-up,( twice for me) your stuck with no currency.! First class as first time used travel fx and received when required and the notes we asked for. Used this company twice now and on both occasions the service they provided was wonderful. We all experience the same fears when transferring large sums of money out over the internet.........fear not my transactions were easy and ubncomplicated. I have used this company several times recently as a group of us are going to a family wedding in Poland. Apart from mostly small notes which wasn't great the last time they wouldn't send the zlotys till I sent them 3 bank statements, proof that we had return flights and proof that there was a wedding !!! I tried to cancel my order as I didn't want to send bank statements but they were going to charge me a lot of money to do so. I will never use them again. Thank you for your review Julie. Unfortunately we are legally obliged under certain circumstances to confirm the validity of an order. This is perfectly normal and all Bureau de Changes are subject to the same legislation. We are sorry or lose you as a client but hope you will reconsider when you next travel and can see that as usual we will give you the best value for money.